It's the 100th year that the Missouri General Assembly has met at the state Capitol in Jefferson City. Lapel pins have been ordered, too, but the big celebrations won’t come for a couple of years during the state’s bicentennial. Sometimes, the show of state government is entertainment enough. The General Assembly first met in St. Louis in 1819, two years before Missouri became a state. The capital then moved to St. Charles. Jefferson City became the capital in 1826. The mode of transport to Jefferson City is not the only thing that’s evolved over the years. For more than 150 years, the General Assembly met every other year. That changed after voters approved a constitutional amendment in 1970, according to Miller. To this day, each session technically lasts two years. That’s why 2019 marks the 100th General Assembly. Miller, who started as a Senate intern in 2001, said she’s seen two major shifts firsthand: the Republican takeover of both chambers after the 2002 elections, which coincided with the full impact of term limits. It means legislative staff, workers at state agencies and even lobbyists play a more important role in helping lawmakers get their policy proposals enacted, she said. “We just kind of help them when it comes to ‘Here's the process and here are your options,’ what you can do within the confines of the Constitution, and within this existing statutes,” Miller said. Priddy, on the other hand, doesn’t mince words when it comes to term limits. For years -- this one included -- lawmakers in the House and Senate have filed legislation that would adjust term limits. 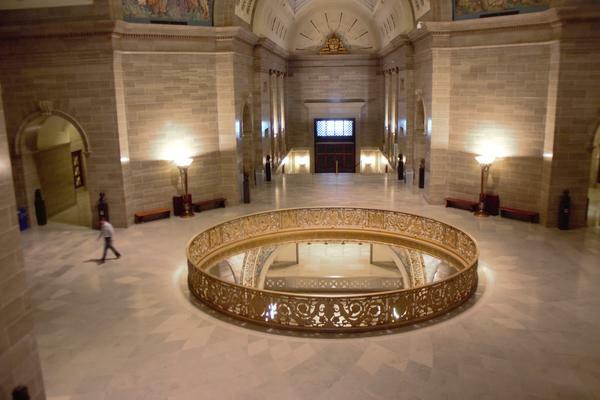 The current Capitol is the third one in Jefferson City, and the one that’s endured the longest. The previous two were destroyed in fires. Visitors often marvel at the building’s high ceilings and historic artwork. But the building is showing its age. A $50 million dollar project is underway to restore the Capitol’s exterior and replace its distinctive white stone. “Our building now is wrapped in what I call the biggest plastic bag in Missouri history while they do a lot of the cleaning and tuckpointing and sealing it to keep it from leaking water,” Priddy said. Once that’s done, attention can turn to the interior. Nothing’s final, but Miller hopes lawmakers sign off on plans to renovate the building. Lawmakers are feeling that space crunch, too. The Missouri House’s 163 members are the fourth-most in the country. That’s why Sen. Jason Holsman, D-Kansas City, thinks the renovations are the perfect time for another change. Both he and Rep. Travis Fitzwater, R-Holts Summit, are sponsoring resolutions that would shrink the size of the House by more than 30 members. If passed, it’d go to a statewide vote in 2020. “This being a unique time in our state’s history, we’re on the verge of the 2020 Census, and we’re on the verge of a full Capitol remodel, which would change the makeup of the physical structure,” Holsman said, adding it “may be one of the last opportunities in a long time to change the makeup of the legislature itself." And while the legislation has cleared committees this session, Priddy is skeptical it’ll make it to voters. The exterior work should be done in time for Inauguration Day in 2021, which is also the year of the state’s bicentennial.